Benchmark your investment in online media with other organisations in the UK. The IAB and PwC published their full-year figures for online advertising in 2012 this week. We recommend using this annual research on online advertising to benchmark your investment in online media with other organisations in the UK. More than £1 in £4 of ad budgets were spent online for the first time and online ad spend is now closer to 30% of all spend although the figures weren’t disclosed in the latest announcement. Total mobile display advertising (including video) increased like-for-like by 121% to £150.0 million in 2012. Mobile search grew like-for-like by 164% to £365.0 million – accounting for 69% of mobile ad spend. The remaining £11million of mobile ad revenue is primarily accounted for by classifieds, SMS/MMS and other smaller advertising formats. The research shows the most popular online advertising tactics, but beware the methodology – spend on other digital marketing channels such as affiliate marketing, SEO and online PR/Social media aren’t included – it’s pure media spend only.. Paid search advertising: Paid for sponsored listings such as AdWords maintained their position as the largest single format with a 58% share of digital advertising. 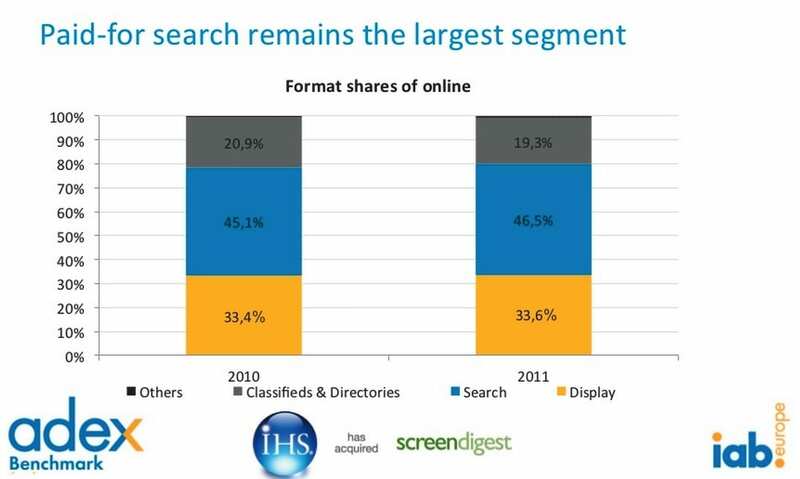 Display advertising: Display advertising accounted for 24% of spend, similar to previous years. But within this there were larger increases for social media advertising which grew 24% to represent 25% of online display budget and video advertising which grew 46% to account for 12% of online display budget. Classifieds : Online classified ads important in recruitment and auto for example, but less relevant to other advertisers grew by 7.6% to account for 16% of spending. Some interesting stuff here to consider when you are planning your or your clients next year of digital ad spend. This entry was posted in great marketing, greatmarketing, marketing, mobile marketing, Uncategorized and tagged advertising, digital advertising, mobile marketing, social marketing, UK digital advertising by Dan 'Great Marketing Works' Sodergren. Bookmark the permalink.